I can also play the recordings I made on my Freeview Play recorder on the HUMAX H3? If you have Humax Freeview Play recorder (FVP-4000T) connected to the same network as the Humax H3, you will be able to access all your recordings in another room. You can even set a recording from your H3. Can I extend the internal memory of the HUMAX H3? The H3 has enough memory for commonly used apps. The internal memory is not expandable. If you have an Android device, you can mirror your mobile screen on to your TV. This feature is not currently available for iOS. 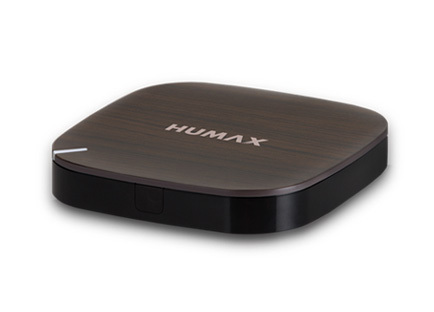 Can I transfer pictures, music and videos from another device playback on the HUMAX H3? You can play all your media contents on the big screen but there is no storage facility for these media files. You can play back your media files via USB port or DLNA media player. Does the H3 Espresso support Dolby Digital? Absolutely! Where available this device fully supports Dolby Digital. Your H3 supports the most widely used Dolby Digital format. Can I watch Netflix on the HUMAX H3? Yes, this device support Netflix but you will need subscription for the service. Can I add apps yourself on the HUMAX H3 which are not in the store? The H3 has great selection of Humax approved Apps and we continue update and improve one these. For security reasons and reliability of the box, we only suggest you use the approved Apps. Can I use the HUMAX H3 even when Wi-Fi hotspot? Yes, you can use Wi-Fi hotspot. However, for the most stable connection we always recommend connecting via Ethernet cable. If you still prefer Wi-Fi hotspot simply go through the VPN menu, choose to make Tethering and portable hotspot. Why can I not control the sound when I use the HUMAX Cast App on my Android phone? There is currently no audio control via the Humax Cast App. And we always recommend you use the remote control provided. Can I connect the HUMAX H3 to my stereo? By connecting your H3 via HDMI you will get fantastic sound. However, if you want to little extra, this device also supports the optical digital output. Do I need an antenna cable for the HUMAX H3? No Aerial or Satellite required. The H3 streams from the Internet, wirelessly with Dual Band Wi-Fi built-in, so connecting to your home broadband couldn’t be easier, giving you live TV. This means that you can use H3 to upgrade any TV in the house to a smart media player. How long will the Apps work? At Humax, we are always working to bring you best contents so you may find some Apps will be regularly updated or removed. Which apps are in the HUMAX store? There are additional entertainment and lifestyle apps available via the Humax portal (myhumax.net). How can I control the HUMAX H3? How do I connect the HUMAX H3 on my TV? Setting up your H3 is easy! 4. When Wi-Fi is unavailable we recommend Ethernet connection. Both HDMI & power cable are included in the box. In case of pairing failure? If you see the message ‘unable to connect’ when you enter your password, try selecting show password option before entering password. How do I pair my FVP-4000T? 1. Before paring your devices, you must ensure they are connected in same network. 3. If the devices are connected to same network, you should be able to see the name of your STB. Do I need an Internet connection for the HUMAX H3? What can I do with the HUMAX H3? HUMAX H3, turns your TV into a Smart TV. This smart box gives you access to entertainment apps such as TV player and YouTube. You can also enjoy hours of TV, drama, movies and BOXSETs of your favourite series via Netflix. (Subscription required). And if that’s not enough, browse the web, listen to countless podcasts and internet radio streams. “EYE” integration for easy review and monitoring via the cloud.